Global Game Jam is the world’s largest creative event where thousands of people in hundreds of locations worldwide gather at local sites to meet other creative people, artists, programmers, sound designers, writers, and game enthusiasts to build games over a span of 48 hours. 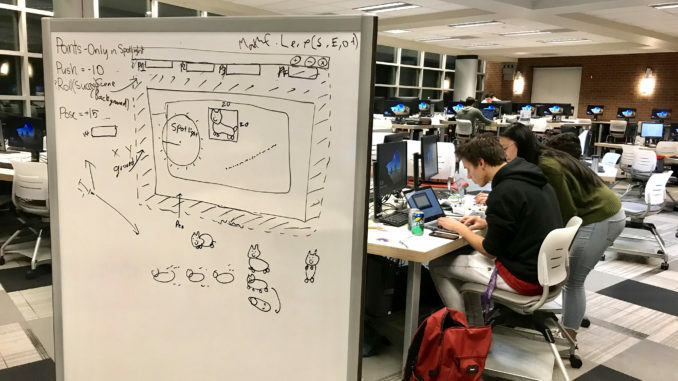 Bellevue College was one of the local sites that held this year’s Global Game Jam. BC welcomed jammers of all levels and backgrounds. Participants could jam solo or with a team of friends. People didn’t have to worry if they lacked a team, because they could form one at the event. Admission was $10 for BC students and $40 for non-BC students, and each ticket included six meals on-site. The event’s registration opened at 1 p.m. in N building, accompanied by open gaming. At 3 p.m., four different pre-event workshops began; they covered introduction to Unity, Intro to Coding for Designers, Intermediate Unity and Introduction to Design in VR. Participants watched a 20-minute Global Game Jam keynote and theme introduction for 2019 in N 201 before pitching their ideas. This year’s theme was “What Home Means to You.” Many of the attendees pitched their game ideas in the front of the room before everyone moved to N 250, which was the main game development area. “It is Maker Space’s first overnight event, and this is the first time participants can stay here 24 hours,” Mohammad Mian noted. The Global Game Jam at BC was a success. Most of the participants were able to showcase what they had built over the weekend on Sunday afternoon.